CreatineHi Tec Hyper Fusion - 240 kaps. Hi Tec Hyper Fusion - 240 kaps. Advanced fusion of the 10 !!! most forms of creatine in a single formulation. It supports the growth of fat-free muscle mass! Hi Tec Creatine Hyper Fusion is the twenty-first century. In preparation put together with you 10 most modern forms of creatine, the most stable ester creatine to the creatine molecules coupled with organic acids and a new, revolutionary anabolic - creatine orotate. 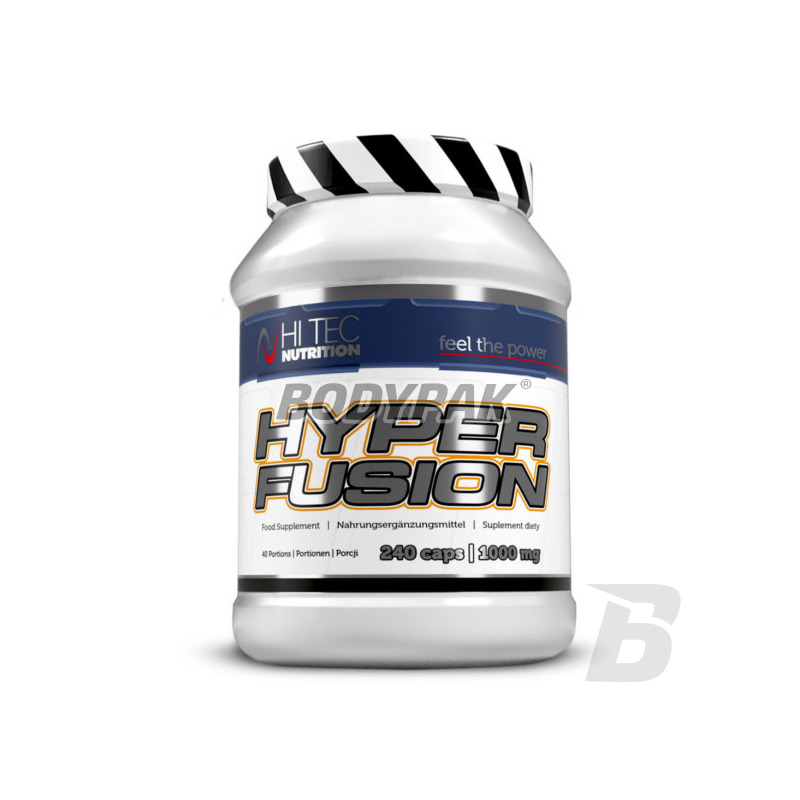 With this recipe, we can ensure that, after the application of Hi Tec Hyper Fusion, every bodybuilder, even the most resistant to a variety of individual forms of creatine, will be all huge benefit in the form of increases in strength and muscle mass. Composing our preparation we wanted to maximize the performance potential of creatine proven over the years, by combining it with a strong anti-catabolic - HMB, activators of the Krebs cycle, and stimulates the synthesis of purine nucleotides and pirymidowych? Orotic acid. Creatine esters are the most stable chemical forms of creatine, so it does not undergo conversion to creatinine in aqueous solution. The critical point is the passage of creatine by gastric acid solution, where the most popular forms of creatine, particularly creatine monohydrate, inactivated. Hyperfusion is resistant to harmful environmental conditions so that each dose of the preparation allows for maximum muscle creatine saturation. In addition, creatine esters have excellent solubility in lipid, which allows them to penetrate more effectively through the barrier from the bloodstream to the cell membrane of muscle cells. Used in Hi Tec Hyper Fusion: malate and a-ketoglutarate and pyruvate (precursor synthesis: oxaloacetate activated acetate and alanine) stimulate the production of energy in the Krebs cycle and increase the solubility of the conjugated forms of creatine, so you interact with creatine in the regeneration resource-rich phosphates? ATP. However, our greatest achievement is the combination of creatine Orotic acid (vitamin B13). This amazing, all-natural anabolic participates in the body in the synthesis of pyrimidine nucleotides and purine indirectly. Nucleotides are the building blocks of nucleic acids and the building known to the increased amount of ribonucleic acid (RNA) in cells stimulates the synthesis of proteins. Further increasing the supply of orotic acid stimulates the liver to release the cytidine and uridine into the bloodstream. The muscle cells with uridine and cytidine recovered is very important activated sugar, which is then used to regenerate the resources ATP. As you can see orotic acid, along with creatine increases the energy status of the cells and directly stimulates muscle protein synthesis. Furthermore, it increases the concentration of b-alanine - the precursor of carnosine that exhibits the pH buffering capacity in the muscle cells (increases the duration of the sub-maximal exercise), and, as a powerful antioxidant, protecting cells against the attack? Free radicals? oxygen and products of lipid peroxidation. Generally speaking orotic acid combined with creatine increases the growth of lean body mass and growth of connective tissue, accelerates the process of wellness system and prevents excessive fatness tissues. Dla mnie bomba! Kreatyna działa dużo lepiej od innych staków, a jeśli chodzi o kreatynę, to tylko właśnie je kupuję! Za nieduże pieniądze mamy 40 porcji! Pod koniec stosowania czułem lepsza regenerację oraz wyniki na siłownię również poszły nieco w górę. Rewelacja, działa niesamowicie dobrze! Pewnie to zasługa składu. Szkoda, że nie ma na to aktualnie promocji :).